Digital Signal Processing (DSP) is at the heart of the Digital Power Slot (DPS) Series subwoofers providing less distortion, customized listening modes and the most output possible. All signal processing of this advanced, yet affordable subwoofer is managed digitally, and is controlled with a single touch of a button using the unique front touch-panel. Located on the panel are four convenient presets for Movies, R&B-Rock, Jazz-Classical and Games, as well as volume control and an exclusive Night Mode setting. 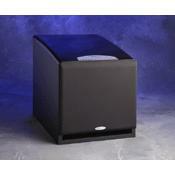 The top panel of this incredibly elegant-looking subwoofer has 15 coats of high-glass, hand-buffed, black lacquer. The DPS Series consists of the DPS-10 with a 10" forward firing driver (8.2" piston diameter) and the DPS-12 with a 12" forward firing driver (9.9" piston diameter). The DPS Series subs easily outperform other subwoofers in their class in both quality and quantity of bass reproduction. Having owned this sub for several years and I must disagree with the previous reviewer. It is not the best sub I have heard, but it is for the price. It has rattled my windows many times while watching video but it is still very articulate for music. I use the B&K AVR 307, KEF 103/4 speakers, Music Hall CD. I have also used various HK receivers and B&K amps. It is a worthy component. I have left it on almost 5 years and no problems. This DPS-10 was given to me not working. Being a tech for a long time, it did not take me that long to check it out, the speker delay ON relay is not turning on, so to test I had to bypass this future. This eliminates nasty popping on turn on. Speaker works just fine, but I need to fix the relay on anyway. Speaker is not that bad, it does not have sound that great, but the electronics is another story, especially the amplifier board. As this is build in 2006, it is incredible piece of crap, (read very poor quality circuit board and components used), no wonder it quit working on the guy who gave it to me. The other thing I see is the price for it on the net, $400.00, this must be a joke. From what I see inside, I would not pay more than $100.00 for this. Price - Can be found VERY reasonable right now!! Sound - Digs deep @ 28-120hz and it's clean and tight. Build - Cabinet is not cheap pressed board junk black with piano finish on top. Looks attractive in your room and it's not small but it's not huge either. Cabinet(H/W/D) 16.25" x 14.5" x 17"
Comes with heavy duty rubber stick on feet for hard wood floors. You put these on when you get it. The sub is well worth the money and you won't be disappointed!! Can't tell by looking as to where the volume level is turned up to. Would been better if they just had it the old way with knobs on the back. Heavy @ 60lbs but ANY good sub is!!! Before I bought this I did the same thing your doing right now.....read the reviews! All I read on this DPS-10 were at min 4 outta 5 stars. Well now that I got it I fully agree! The sound is tight and responsive...look very attractive with a piano finish on top. Works very nice with Home Theater as well as Music. I'm very pleased with it and it REALLY rocks my house with 185watts RMS. In reality it's a modern replacement for the CT-100 with a lil more kick. Ct-100 was 150watts RMS 375watts max where the DPS-10 is 185watts RMS 375watts max. CT-100 was Analog where the DPS-10 is Digital Controlled. THIS IS THE BEST SUB IVE EVER HEARD... WORTH EVERY PENNY!!! NOT A ONE NOTE SUB. SOUNDS VERY GOOD NO MATTER WHAT MUSIC YOU LISTEN TO. VERY DEEEP AND DOES NOT BOTTOM OUT. Ok, here was my dilemma. I wanted punchy bass (feel the gunshots & punches), but I still want the depth & rumble of a 12"sub w/out distortion or slop. I went back and forth between the DPS10 & DPS12. I previously had the Velodyne VRP1000 & that just didnt cut it. Anyways, i just hooked up the DPS10 last night & spent today tweeking it & I must say that there is a HUGE difference. I was quite skeptical when i got, but that changed quickly. I had to have my reciever +8db for my sub & now its flat level. And, its hits MUCH harder. The sound is very clean, controlled, accurate & smooth sounding. I broke it in w/ Underworld, Incredibles, & Sin City. The punch was very nice. Due to the front port design, the positioning of this sub is VERY important. I also realized that the presets on the sub are nice, but pretty useless. I've found the jazz/classical setting to be the one i use most & just work the volume from there. I've used polk, infinity, harmon kardon & other velodyne subs before & this one has brought the biggest smile to my face thus far. Highly recommend. So...they say a good subwoofer is critical for great audio experience? They dont lie! But what if you want an AMAZING audio experience? Music's nothin' without tight bass and movies aren't good at all without deep bass. So what about a subwoofer that would work in those two cases? I've tried and tried and tried so many subwoofers (too much I think 'cause Future Shop hates me now lol). So many I don't remember the exact model names. But what I remember, is that from 200$ to 600$, you have what you paid for. As a matter of fact, I stopped trying when I hit the DPS-10. [I was wondering if I would be better with the 12 inches one but..... gotta listen at it to beleive it]. Buy this and we will be talking about quality bass. Music and movies are not the same anymore since I own this little baby. And have you seen this beauty?... with little ledz in the front, all black with a kinda metal cover. Like I will always be saying, sound listening is different to every person. Your ear could be more satisfied with more power or more quality but mine said: hey that's what I want to hear! But PLEASE, stop looking for yamaha or Quest bargans... you're never gonna be able to be satisfied. Sorry that I got no deal on this piece of equipment but for 650$ (with taxes and 15ft coax cable), it's actually worth spending that much of money into a single speaker. - Frequency crossover - Set the bass type you want - Looks great all black with curves and blue ledz - 0 or 180 degrees switch depending on how you place it in your room - Well built amplifier **Value rating of only 3 stars? You get what you pay for!